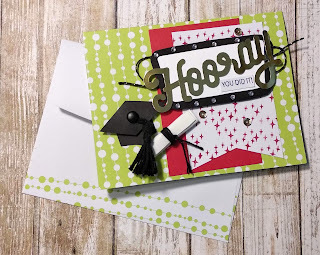 Hello everyone, I am back with a couple of graduation cards. I have two great nieces who are graduating this year after completing grade twelve. So excited for them as they both have plans to continue their education! I had used Stampin' Up June 2018 Paper Pumpkin Kit! what a fun kit to play & create with. I just love how these two cute cards turned out! The hat and scroll were not included in the kit, I made them by hand and love how they turned out. Have a great weekend everyone! and to all my Canadian friends, have a GREAT Canada Day weekend!